When taking the “Transform and Build” action, you may skip one Terrain or River space by paying 1 more Priest (Carpet Flight). Get 4 Victory points each time when doing a Carpet Flight. In the final Area scoring, any Structures that can be reached via Carpet Flight are considered connected (regardless of the number of your leftover Priests). It’s well known online that the Fakir are generally underpowered – carpet flight seems decent, but it uses a valuable priest, AND you still have to transform and build normally. The main advantage of the Fakir is that it’s almost impossible to box them into a corner, and thus they can have a good shot at getting the highest area scoring. Objective: A distributed, large area, with two Towns, connected by Carpet Flight. An early Stronghold is an option for you, because it generates a priest income. However, you can delay it to suit the Round tiles if needed. You will still need a priest income almost from the beginning of the game. Use Carpet Flight to get the easiest tiles to Transform first, then start connecting your structures once your income improves. 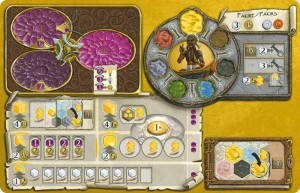 Due to the need for extra priests and a maximum of 2:1 workers for Transform actions, whenever possible, the Fakir should use the Power action to Transform or the Transform Bonus tile action. Two temples are almost always better for you than one Sanctuary, because of the priest income, unless you need another town and you only have three adjacent dwellings.